The Tor Vergata University of Rome - Department of Economics within the Master of Economics and Sport Management, in the persons of Prof. Sergio Cherubini and of Mr. Tommaso Nastasi, organizes the first competitive watch focused on national and international boating markets. The Boating Market Watch (OMN), with the creation of a specific market intelligence system, provides high added value service for boating companies and institutions. 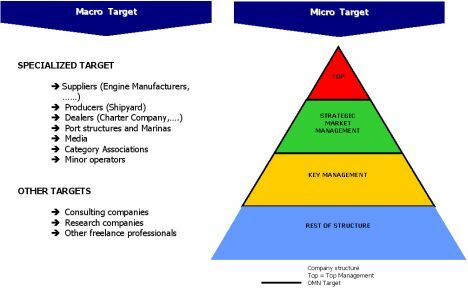 OMN mission is to support, with a series of ad hoc products and services, the analytical-strategical-operational process of operators of the recreational boating world (all sectors) with specific reference to the market (see figure 1). Market Tracking News: non-stop tracking of the recreational boating market evolution, on a worldwide scale, using a tracking source system created for systematic and organized collection of the most important news of the international boating panorama. Company: collection of the most important quantitative data related to the major boating companies operating on an international level. Boating Industry & Market: collection of the most important data specifically related to boating companies and markets of the major countries on a worldwide scale. 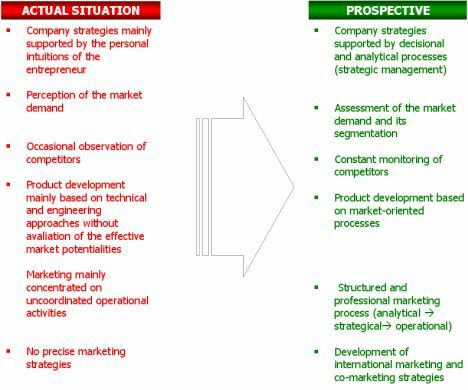 Product Benchmarking: competitive marketing instrument that supports comparative analysis between products of different producers operating in the international boating market in view of strategic product development, aimed at planning, acting and controlling the competitive position within the selected market share. Company Profile: it offers a summarized profile of the main boating operators acting on the international level. The Company Profile presents a complete picture that includes basic information, the description of market coverage and the product range of each boating company. Country Overview: the organized and systematic collection of one of the most important qualitative and quantitative data of major boating countries. The aim of this services is to support the internationalization process of international boating operators on a worldwide scale. OMN News Letter: OMN, with its differentiated activities, periodically issues a newsletter containing an organized collection of the main news of the international boating panorama, on the basis of market categories. These newsletters are sent to subscribers and are also stored in a suitable online file with restricted access. Industry Reports: monitoring reports on the performances of the major companies of the international boating market are issued. These reports are aimed at providing important quantitative and qualitative indications for the decision- making strategic process of international boating operators. Market Research: quantitative/qualitative research projects on specific subjects related to the boating market. OMN also offers the possibility of creating multi-client market research projects. Consulting Service: company consulting projects (marketing, strategy business development, etc.) using OMN know-how tailored to each client. Training: OMN offers long and short term training courses as well as single or multi-company project training. For a prompt, flexible and customized service, OMN created a web site (www.marketingnautico.net) with different restricted areas but with unlimited access to subscribers - a specific membership subscription is to be paid. OMN is addressed mainly to all those who, within the various boating organizations, manage and organize activities connected to professional boat marketing. OMN reckons two main target categories: specialized operators and other operators (see figure 2). Consistently with its mission, the different products and services offered by OMN may be used to cope with the needs of the upper range of the company pyramid. For years, Nautica Superyacht magazine, a partner of OMN, has been supporting the Tor Vergata University of Rome - Department of Economics in a series of initiatives.